Tough lady creates perfect mix to deliver the job - Sta. Lucia Land Inc. It must have been her passion for baking that made her a perfect fit for the job. Baking calls for precision, meticulousness and innate accuracy. If all these criteria are met, then what one would have on her hand is a masterpiece that even the cake boss would definitely commend and approve of. And these exactly are the traits that baker and Sta. 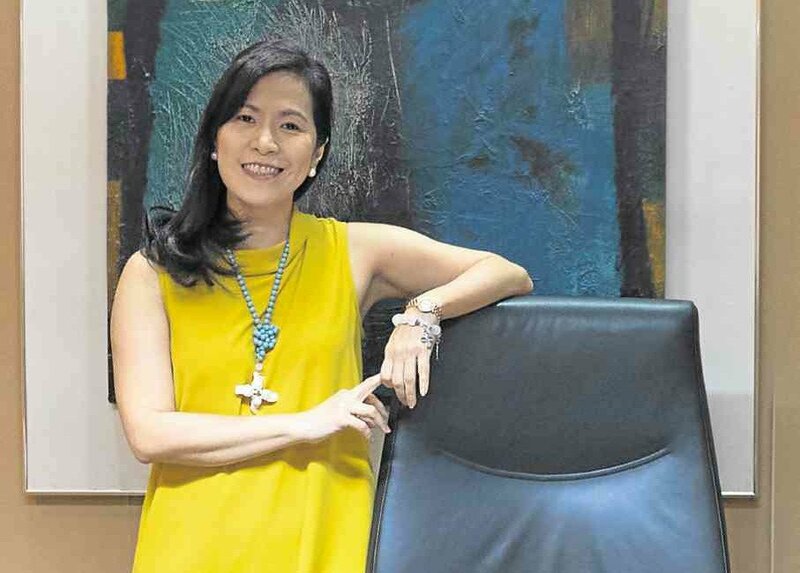 Lucia Realty and Development Inc. vice president for purchasing Aurora Robles has exemplified since the time she became a part of the family-run business. “My heart was for baking and cake decorating that I even took up a course at Wilton in Chicago, Illinois. However, fate must have had a different plan for me—one that’s more challenging but definitely even more fulfilling and rewarding,” Robles claimed. Currently heading the company’s purchasing department, Robles has been involved in the family business as far as she can remember. She literally did her on-the-job-training with the company when she was just 18, doing menial jobs like filling and attending to sales and reservation. “We were raised by our mom differently. At an early age, we were already made to understand about the value of money and the importance of hard work. Growing up without a father to provide for us, we had to early on learn to fend for ourselves and help grow the family business,” Robles said. “I was only seven when my father passed away so you can just imagine the hardships the family had to go through. Good thing my brother Excy (Sta. Lucia Land president Exequiel Robles) was there to continue and keep my father and my aunt’s legacy alive by ensuring that the family business kept abreast with the needs of the times,” she further said. Growing up, Robles was just like your typical teenager who dreamt of celebrating her debut and doing things that any regular individual her age would do. Only this time, she had to devote much of her free time learning and understanding the ropes of the business. “I started really as a purchaser, I was the one tasked to handle everything that concerns the purchasing of construction materials for all our projects. It was as they would say a job cut for men but my passion and discipline allowed me to handle such tedious and daunting task,” she noted. “Initially, there were some resistance from the various project heads as they were not used to having a woman deal with them—more so that it concerns acquisition of products like cement and other similar products that you would typically see and use in a construction site. But this didn’t deter me and I, in fact, turned this as an opportunity to help Excy put order in the way things are done in the company,” Robles further disclosed. Admittedly, not too many were that keen about her appointment as the purchasing officer. But seeing how effective she was with the job and seeing how her inputs and techniques did wonders for the company and its operations, Robles finally got the acceptance and appreciation from her colleagues at work. “All men from both the Robles and Santos side were assigned to be project managers. They were the ones working mostly on the field to supervise the completion and proper turnover of projects. On my end, I was tasked to handle sales and reservation with P400 as my initial allowance,” Robles said. “But you see the purpose really was to train and ingrain in me the value of working for the family venture because they knew then that I had plans of working abroad which my mom did not really approve of,” she explained. Robles recalled that when she was 18 years old, she was already much immersed in the business. However, she was fixated about the thought of working abroad and making a name for herself. It never wavered and it in fact grew stronger the more she tried to immerse herself in the family business. “I tried my luck a number of times. But like what I would always say, the universe must have prepared a different path for me that I am now here back in Sta. Lucia, doing things that could further ensure the success of the family business,” she continued. Robles finally accepted her fate and the job for which she has been the perfect fit right from the very start. “I took inspiration from my brother Excy. I’ve seen how hard he worked just to ensure that the company survives and grow to what it is now today: a developer that continues to bridge gaps and fulfill dreams,” Robles said. “Aware of the valuable contribution that I could give, I accepted my fate without fear or any hesitation for I know that I could put on the table new approaches that helped enhance and speed up operations,” she said. Robles: Aware of the valuable contribution that I could give, I accepted my fate without fear or any hesitation for I know that I could put on the table new approaches that helped enhance and speed up operations Robles: Aware of the valuable contribution that I could give, I accepted my fate without fear or any hesitation for I know that I could put on the table new approaches that helped enhance and speed up operations. Robles added that her being a baker—one that’s used to precise measurements and consistency—proved to be more than enough for her to take on the heat in this cutthroat business. “My passion for baking truly helped as I know how to better appreciate order when I see one and to call attention once something’s done that isn’t consistent with the Sta. Lucia belief and way of life,” Robles claimed. Right now, Robles said she can only thank her brother and her loved ones for the undying support and the trust that was given her. “My children continue to inspire me to do good. And whatever it is that I have learned from my mother and the many experiences and challenges I’ve gone through in my life, I try to impart it to them, so that way, I am assured that they will also have a good future,” Robles shared. For now, Robles said she was looking forward to finding an even better cake recipe that could further allow her to hone her craft and master the ropes of the business. hat it allowed me to live my dream—from baking to traveling and even contributing to a family venture that. For many, this has been more than just a business, but rather a testament of how far our families have come and how the company has evolved and changed not only our lives but also those we’ve helped through our developments and various advocacies,” Robles concluded.